Manufacturer's Description: Perfect for photojournalists, the all-weather, airline carry-on LowePro SlingShot 200 AW uses a sling design to go from “carry mode” to “ready mode” in just seconds. Carried comfortably on the back, it rotates to the front so you can get to your camera quickly. The SlingShot 200 AW holds an SLR with mid-range zoom lens attached, 3 or 4 extra lenses, cables, and accessories, and has a full-access lid to make loading it a snap. This feature-rich bag also includes a built-in memory card pouch, micro fiber LCD cloth and two generous organizer pockets. This is a great camera bag. It keeps everything at the ready and I can fit a lot in it : Canon 300D, EF 24-105 f4L, EF-S 10-22, EF 70-200 f4L plus their respective lens hoods and the EF-S 60 macro when I feel I might need it. When the macro stays at home I fit the 550 EX flash in it. While normal and wide lenses can stay on the camera, the tele lens has to come off before the bag zips back up. I use the 100 model of this, and love it for a small pack, though it carries everything I own. I had jerry-rigged a non-photo bag to do virtually the same thing, but this is definitely better. When I want to expand, I think I'll add one of their lens cases that attaches to the side. Very versatile. Honestly, if this bag didn't exist, I wouldn't be using a photo bag at all. That scares me how much I'm beholden to the good design work of bag manufacturers. 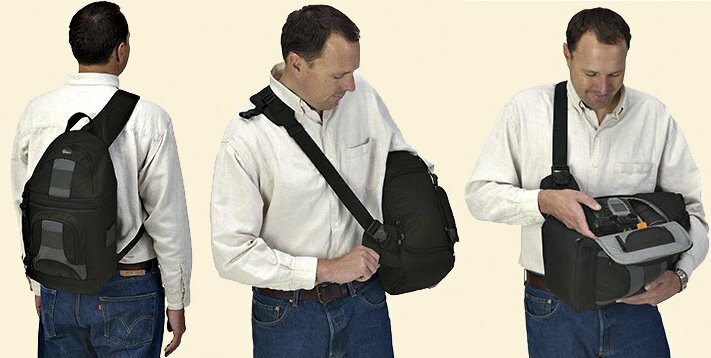 It does take a bit of practice to become facile at quickly swiveling the pack for access (without accidentally dumping anything--although there are guard straps to prevent accidents) and then returning it to your back. The stabilizer strap that provides cross tension on the main sling strap is a very effective mechanism for keeping the pack stable during movement. When everything's adjusted properly you may forget you're wearing the pack at all. If I had to point out a negative aspect of the SlingShot's design it would be the difficulty of accessing items stored at the back/bottom of the main compartment when the safety straps are engaged. I still prefer carrying a small, conventional bag (ex: small LowePro Stealth Reporter) but the SlingShot bags really challenge it for comfort. Nice bag. Only a shame that LowePro seems to generally follow the 100 years old dictum of Henry Ford: "You can choose any colour - as long as it is black!" The Lowepro Slingshot ended what had been an endless, unsatisfying search for the perfect bag. I carry (in the 100 version), my DSLR, 31mm, 43mm, and 77mm limited lenses, and my flash. It makes the perfect travel companion for me, my wife, and my 8 month old daughter. Thumbs up for the 100! I've been using one since doing a bit of research and picking one up at the end of 2005 for my EOS 20D plus 3 lenses, along with a few random bits and pieces in the top pocket. It's great for travelling with. Picked one up for a trip to Italy. Excellent bag. Held a 20D, 17-40, 50 1.4, 70-200 2.8 IS and a 1.4x converter. The really cool thing is I could get the 70-200 mounted to the 20D into the bag! Only thing I would add would be more velcro to the interior of the main compartment to position the partitions better. I think I was pushing the envelope with my setup though. Hikes well too. The 70 200 is not a light lens. I bought a PAQ BP-04003 Slingshot Backpack for only $50. It has padded compartments for lens and flash. Quality material and stylish look. Highly recommends to those who do not want to spend extra for the 200 AW. anonymous said (at 10:14) that he could get he 20D with 70-200 f/2.8 and 1.4x converter into the bag while mounted to his 20D, but another anonymous said (at 6:02) that he had to remove his 70-200 f/4 for it to fit ok. That doesn't make sense... is someone confused about what bag we are discussing here??? The Lowepro Slingshot 200 AW replaces my Toploader 75 AW. The Toploader was a great bag but it was just too uncomfortable to carry for any reasonable duration. The Slingshot WILL NOT hold large lenses that the Toploader is capable of. I bought my Slingshot this morning and have just spent the whole day with it on a photo outing. This pack is everything bit as good as the reviews tell you! It is absolutely the most comfortable AND accessible bag I have EVER owned, all my gear fits perfectly. Having my power adaptor, cables, and accessories with my camera means I can just grab and go, the seperate top compartment and front pouch of the Slingshot 200 AW allows me to do this with ease. There is even enough room to squeeze in a sandwich for those long walks. My only complaint about the Lowepro Slingshot 200 AW is the distinct lack of padding at the base of the bag (when standing upright). I would be a little nervous putting sensitive gear in the lower compartments. Hopefully Lowepro will address this in the next iteration. I also have one other recommendation for the next model, and that is the inclusion of some method to hold/carry a modest sized tripod... then you get perfection! If you do not have really large lenses, then the Slingshot 200 AW is *THE* bag to buy. You will not regret it! !